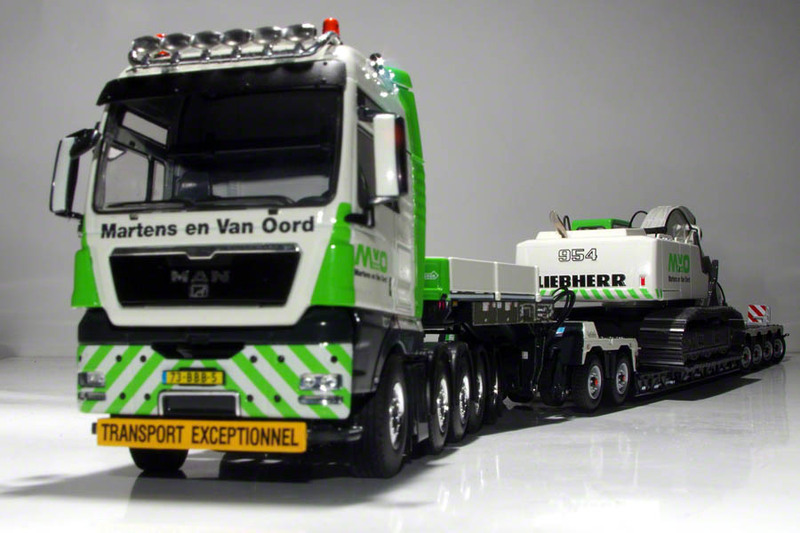 The scale model of the MAN TGX with Nooteboom Pendel-X lowloader is made by WSI. The reviewed model is in the company livery of the Dutch contractor Martens en Van Oord. 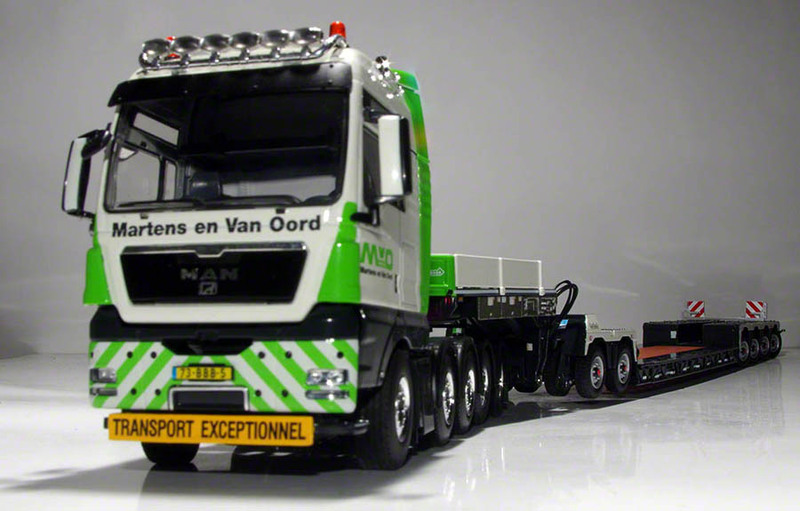 The real truck can move loads up to 67 tons without Interdolly and 88 tons with Interdolly within the Netherlands. The model comes in a Martens en Van Oord branded cardboard box and is enclosed in two transparent plastic trays. A small bag with separate parts comes with the model however, there are no assembly instructions included. The 5-axle tractor is nicely detailed all around, with the fuel tank and storage compartments modelled in plastic behind the cab. The tractor has the original license plate printed on the front and back. The fifth wheel can slide forward and back to suit various trailers. 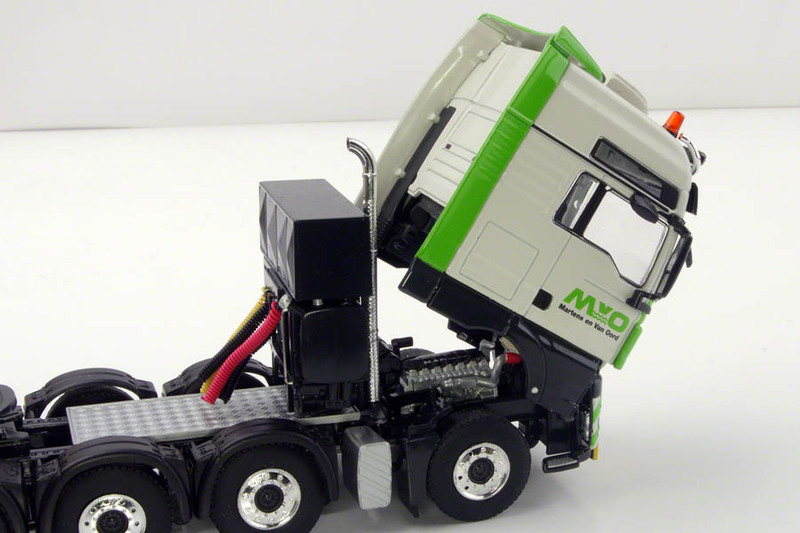 The cab can be tilted to reveal the nicely detailed and painted engine. Underneath, the axles and driveline are very detailed. The front three axles feature linked steering. As with most WSI models, the steering angle is very limited. Going to the trailer, the gooseneck is very detailed with tiny decals on al sides, visualising the trailer controls and warning labels. 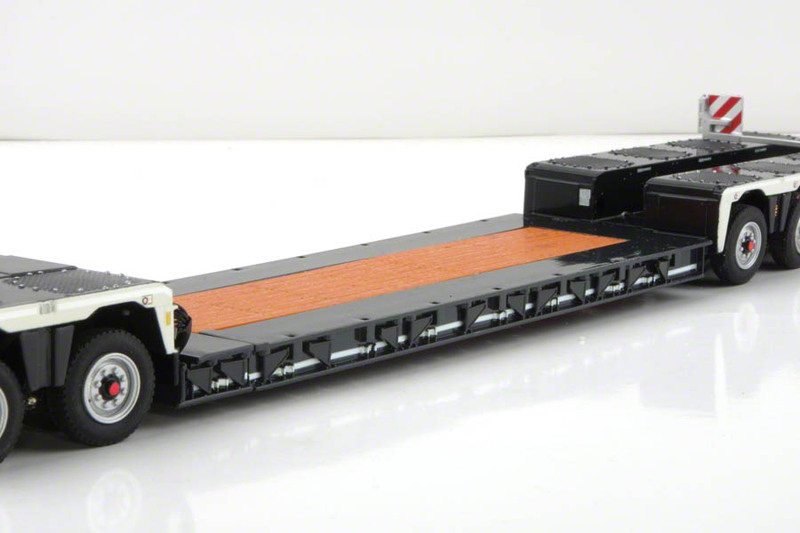 A bundle of hydraulic lines is attached to the gooseneck, which can be attached to either the Interdolly of lowbed. The gooseneck attaches on two hooks of either the lowbed or Interdolly and is kept in place by a plastic clip. This clip is very loose, and can't keep the gooseneck raised when there's no tractor attached. The hydraulics of the gooseneck are also quite loose, and are unable to keep the lowbed raised off the ground without the Interdolly. The 2-axle ICP Interdolly is as detailed as the gooseneck, with warning labels all around and painted bolt detailing on the deck. At the front there is an automatic greasing system printed with the original manufacturers colors and logo. The axles have functional hydraulic cilinders. The axles have no functional suspension, but it is possible to display them in either raised or lowered position. The four pendulum axles feature linked steering and reach a reasonable steering angle. 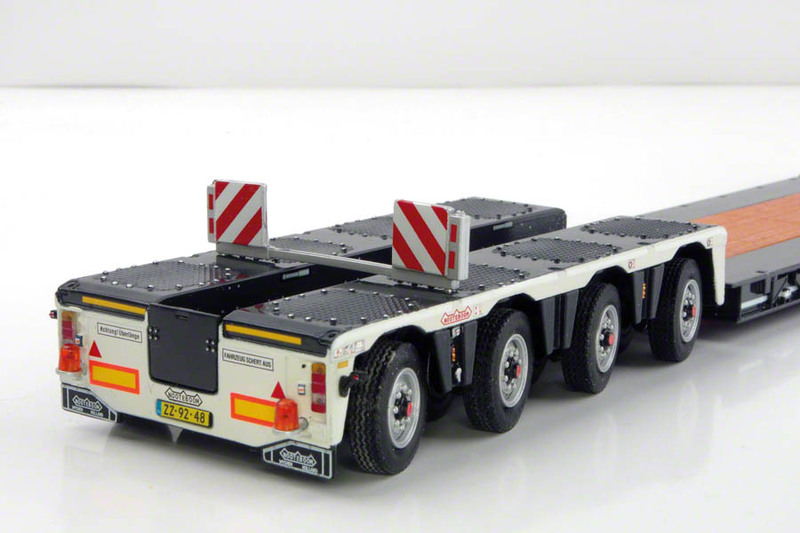 At the rear of the Interdolly, there is another bundle of hydraulic lines which connect to the lowbed. On the Interdolly the various connectors have been modelled. Also on this side there are a lot of decals, showing the Nooteboom logos, printed mudflaps, license plate and power connectors. The interdolly uses the same hook and clip connection as the gooseneck. The axle hydraulics are stiff enough to keep the lowbed raised off the ground when unloaded. 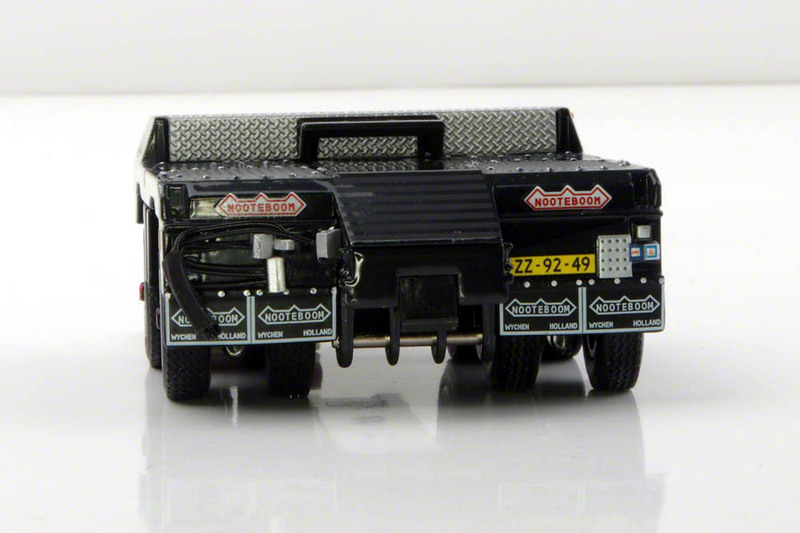 Where the real truck was delivered with both a wide deck and a spine, the model only comes with a extendable wide deck. The deck features a plastic part simulating the wood floor. Small consoles on the sides can be swivelled out to support the included simulated wooden width extensions. The 4-axle rear module of the Pendel-X trailer is also equipped with pendulum axles, which enables a very deep excavator trough. 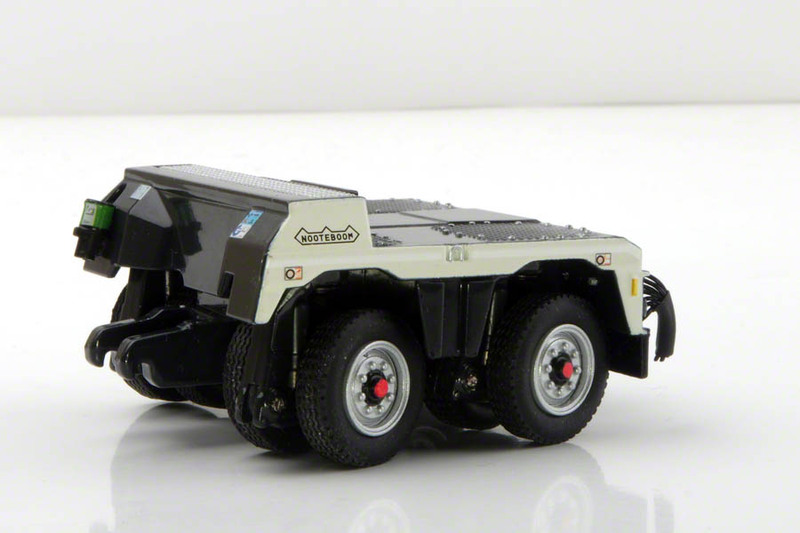 The axles feature linked steering with a reasonable steering angle and working suspension. Also here there are lots of decals on all sides, showing warning and instruction labels, logos and power connections, even inside the excavator trough. A cover on the rear can be removed to allow for long booms to extend behind the trailer. 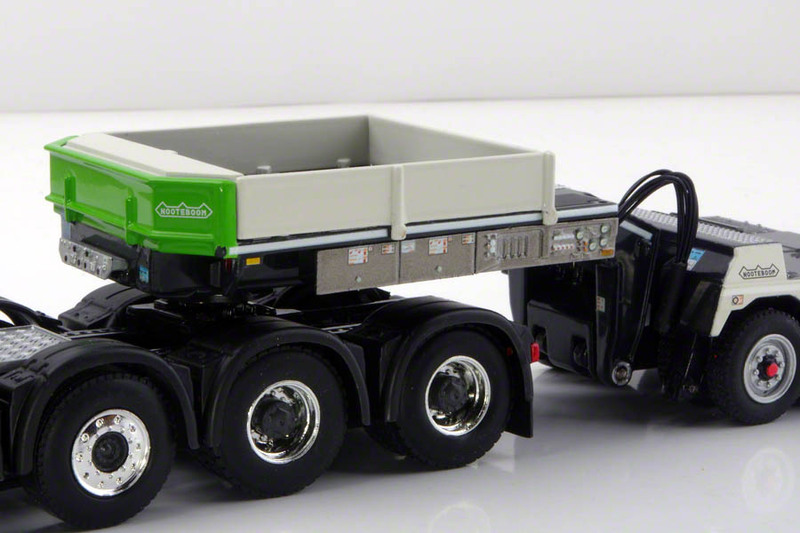 The MAN TGX with Nooteboom Pendel-X lowloader is a realistic representation of the real truck. Sharp printing of the Martens en Van Oord livery and the many decals all around add to the authentic look of the model. 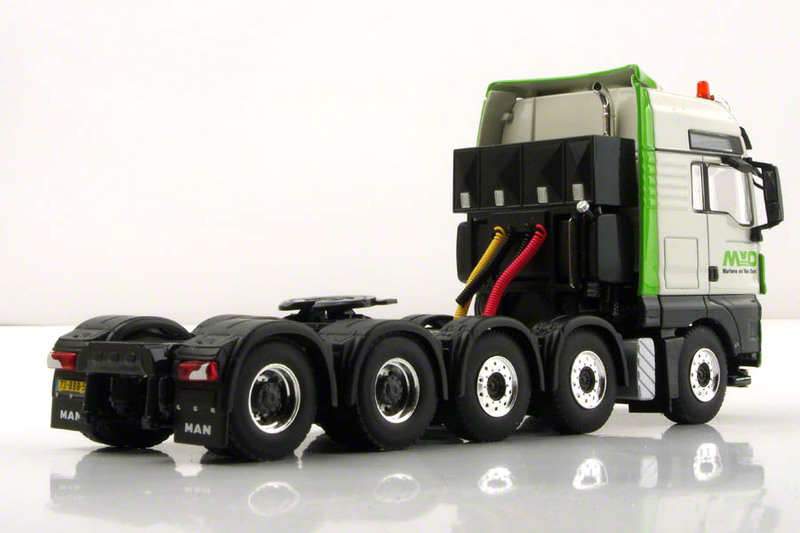 The fresh company livery make the model stand out from other heavy haulage models. This combination is a great addition for any heavy haulage collection, especially when displayed with some matching equipment like the Conrad R954C on the photo above.